I grew up vacationing with my family in Gulf Shores. We looked forward to our summer vacation all year and counted the days between the end of school and the day we would pile in the brown station wagon for the 12 hour adventurous drive to the Gulf. My brothers and I would spend magical days digging holes in the sand, creating sand castle villages, flying kites, running the beach, and splashing in the buoyant and warm waters of the Gulf. At that time, there was a giant swing on the beach and I was convinced you could touch the sky if you tried hard enough... I definitely gave it my best! By the time dusk fell, the smell of shrimp boiling or fresh fish cooking assured big appetites and tired kids. However, not wanting to miss a single moment of our week, we would always hold out for a post-dinner stargazing session or a night-time "crab hunt" with flashlights on the beach. I had so much fun with my parents and siblings during those days. The memories will stay with me forever! Flash forward to 2008 and another stage of life entirely. A dear friend shared with me the "great find" she and her husband had uncovered. A beautiful beach.... all the modern amenities one could want... yet not overly crowded like some of the FL beaches she had visited. Had I ever heard of Gulf Shores, AL?! That friend went on to purchase a property in Gulf Shores... and my husband & I (two young kids in tow) spent a good deal of time with them there. It wasn't long before we knew we also had to find our own spot to share. We looked long and hard for the perfect combination of city and country.... activities for multi-generational families while maintaining tranquility for all. Watersedge embodies all the qualities needed for family members of all ages to enjoy time together. Our location allows for grocery/shopping/dining/adventure activities...an outing at Scoops Ice Cream... without long drives. Walk just down the street for the best place to see hermit crabs, bird watch, or put a kayak in the bay. The property is private yet perfectly sociable. The vibe is of carefree days with your own slice of beachfront. The sheer luxury of time and space in this backdrop allow deep relaxation and fun for all ages. Parents can watch their kids from one of the balconies as they roam the beach. The freshment of going from the beach to the ocean to our freshwater pool, means extended outside time during daylight hours. Although we have speedy Internet, you might find yourself pulling out the board or card games after an awesome meal, around a table that can accommodate the whole crew. The crabs can still be spotted at night as they scurry along the beach. Pods of lights... and the giggles that accompany them, can be heard from our decks. Catch them if you can... but please remember to release them so they can be there for your kids! 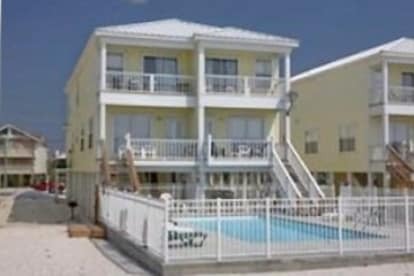 We are so honored to be able to host your family at our beach home. We hope you will relax, recharge, and enjoy the memories you will make with your friends and loved ones!